Bargaining : Bargaining in Saint Petersburg is expected when dealing with street vendors or in markets. Tipping : Services charges are not usually added to restaurant bills, however, a small gratuity (10 - 15 %) is appreciated. Russia has typical dishes, such as : Borsht, a beetrot soup, Beef Stroganoff, thin slices of beef braised with mushrooms, onions and sour cream, and perhaps the known, Chicken Kiev, chicken breasts wrapped around garlic butter, usually breaded and sauteed. The Russians are also well-known for their Caviar (Sturgeon's roe) small, black eggs, slightly salty, served with finely chopped hard-boiled egg and onion with miniature pancakes (blinis). Vodka is the favorite here, drunk ice cold, as a shot. There are a lot of kinds of vodkas available, many with subtle flavorings such as pepper or lemon or some other fruit. There are several quite acceptable wines produced locally and the Russian Brandys are quite comparable. The main shopping district is centered around Nevsky Prospekt. The typical Russian souvenirs are : local handicrafts such as matrioshka dolls, lacquer boxes, painted wooden spoons and other wood-carved itmes and local prints, are available from street vendors. The unit of currency in Russia is the Ruble. Notes are available in the following denominations : 10, 50, 100 and 1000. Coins are issued in amounts of 5, 10, 50 Kopecks with 100 Kopecks in a Ruble. It is controlled currency. It is illegal to bring it into or take out of Russia. Visitors should exchange currency and convert any remaining prior to leaving Saint Petersburg. A receipt for the exchange must be retained. It is also advisable to return your remaining Rubles to the same bank or exchange office that you purchased the from. Exhange facilities are available at most of the larger hotels and official bank or currency exchange offices found throughout the city. It is not reacommended to exchange currency on the street. The central Post Office is located at Konnogvardejsky bulvar, 4. International calls can be made from Saint Petersburg International and Domestic Telephone Exchange and Business Centre with pre-purchased phonecards, available in different denominations; It is located at 3/5 Bolshoya Morskaya Street between the Hermitage Museum and Nevsky Prospekt. Some hotels have satellite telephone booths from which international calls can be placed. The official Tourist Information Office is located on Nevsky Prospekt, 41. Most hotels provide information services for guests or otherwise, althought there is generally a fee. Taxis are available anywhere but make sure you choose the driver who can speak English. Only a few taxi drivers speak English. In addition, It is advisable to negotiate a fare prior to departing and recommended to travel with a companion. It is dangerous to hail a cab with more than one person in it. 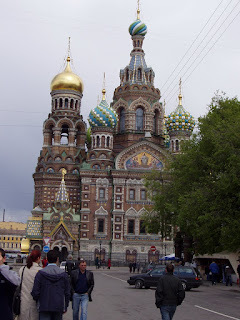 Saint Petersburg has a bus and tram system but it is not wise to use by foreigners who do not speak Russian.